1,000’s of motor vehicles are damaged daily in accidents and incidents around the world, and there are different standards applied to each and every vehicle. Many of these vehicles are repaired by approved body repair centres and continue in use for many years; a proportion are written-off and end up in a salvage yard for disposal. Many will believe that these vehicles should all be scrapped, but this is not the case as some countries will allow some salvage motor vehicles to be repaired and placed back into use. In the UK there is a voluntary code of practice in place that is administered by the Association of British Insurers, the header states that all members of the ABI should adhere to the code along with members of some other organisations listed in the same part of the code. The code separates written-off vehicles into 4 separate categories, A, B, C and D.
Category A is pure scrap - it is worth so little that all it is good for is processing through a metal recycler. Category B is Break Only - so badly damaged that in the opinion of the insurance assessor the vehicle is unsafe and should be taken out of use, however there may be some ‘bolt-on’ parts available for re-use in another vehicle. These parts can be removed, once this has been completed the vehicle structure (body or chassis) MUST be destroyed and a Certificate of Destruction issued. Category C is one category of repairable salvage - the assessed repair cost exceeds the pre incident value of the vehicle, but the vehicle could be safely repaired using cheaper labour and green recycled parts. The assessed repair cost is calculated using the insurers normal methods of repair, labour and parts costs - in many cases these would be a computer generated assessment using Thatcham or vehicle manufacturer generated repair methods and times, dealer labour charges and brand new parts. Category D is the second category of repairable salvage, the assessed repair costs do not exceed the pre-incident value of the vehicle, but the insurer knows that claims costs can be minimised by writing the vehicle off, paying the market value of the vehicle and then banking the salvage sale funds. The difference between category C and D is quite clear and easy to determine - the market value of the vehicle is key and drives the decision, repair cost over the market value = cat C, repair cost under the value of the vehicle = cat D, simple! Deciding between category C and category B is much more subjective and comes down to two words - could or should. Could the vehicle be repaired safely and economically using accepted industry standards? Manufacturers’ or ‘Thatcham’ repair methods must always be used but independent or second-hand parts and reduced labour rates may be applied. The need to remove the vehicle from a possible theft chain e.g. a stripped out vehicle requiring unobtainable or expensive replacement parts. No vehicle should ever be categorised as repairable on the basis that second-hand shells/ frames will be used. Some vehicles, especially higher value ones, may be considered technically economical to repair but often they are so severely damaged that they should be categorised as Break only. It is the inspecting engineer’s responsibility to apply good engineering practice and safety considerations when deciding whether a vehicle is to be sold for repair, totally destroyed or broken for spares. Fire and Flood damaged vehicles must be treated appropriately, and does require a slight change in thinking. 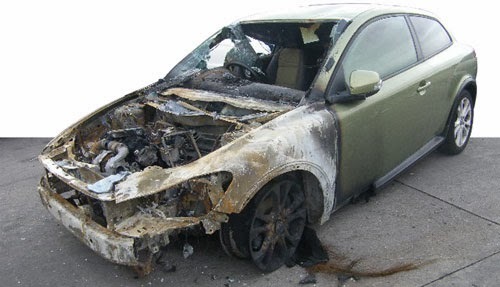 Insurance engineers must look at the potential for a safe future repair of flood or fire damaged vehicles and take into consideration the increasing use of Ultra High Strength Steel in vehicle bodies and the electronics present in high tech safety systems. If the vehicle is repaired and is then involved in another incident will it perform as the manufacturer intended and protect the occupants of the vehicle? I recently saw this fire damaged vehicle being sold as category C salvage, extensive front end damage affecting structural parts of the vehicle, can this be safely repaired? I believe that it is time for a choice to be made by UK insurers on vehicle salvage categorisation, and it is simple - use it or lose it. No code at all will result in a free-for-all system where anything goes and criminal elements can prosper. Legislation will come into force that could be far more stringent and costly than just adhering to the code. The UK has the chance to become a world leader for vehicle salvage, to set the standards for the rest of the world to follow, to have safe and ethical practices that protect vehicle drivers, users and the general public, to remove unsafe vehicles from use and promote the use of green recycled parts for those vehicles that can be safely repaired, so let’s grasp that opportunity and move forward.